The first task confronting the Society of Living Folklore is to challenge the arguments of our predecessors in conventional folklore studies in order to establish new theories. In other words, we should commit ourselves to sharpening our sensitivities. Secondly, we must verbalize things that have been considered too commonsense to explain, deepen dialogues with scholars in other academic fields, and make our studies substantial in order to lead to open discussions. Thirdly, considering the historical background of Japan, which has long been influenced by China, the hegemonic nation in Asia, we should grasp Japan’s folklore and internationalize it to make it possible for us to conduct exchanges with scholars in Western folklore studies. The study of folklore arose from the urgent need to preserve the fast-vanishing remains of folklore in emergent modern societies in the late 18th and early 19th centuries. Once folklore was thus conceptualized as anchoring in the distant past, a principle problem of its researchers was how to resituate the significance and relevance of folklore and its studies within the present-day social and intellectual contexts. Japanese folklorists have kept away from fully engaging in the reexamination of such a conceptual dilemma of folklore. It is long overdue that they take issue and deal with how they could overcome the earlier disciplinary paradigms, and reformulate folklore into a contemporary subject. Calling attention to the need for a discussion within a larger transnational network of folkloristics, this article takes a look at the way their American colleagues have challenged the temporal difficulty of folklore, particularly with regard to the notion of “survivals,” which has persistently clung to the term “folklore” in popular English usages. Among various reflexive efforts of postmodern perspectives in American folklore studies, this article places a focus on the critical historiographies of folklore studies, through which American folklorists have argued and sought after a future direction for and possibilities of the discipline. This paper discusses future prospects of folklore studies through a differentiation with academic discussions in other disciplines. 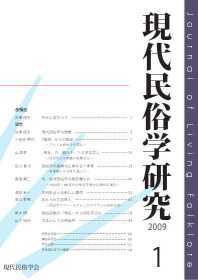 The author considers the position of Japanese folklore studies and the internationalization in folklore to be one of the projects of the Society of Living Folklore. From here an attempt is made to analyze the position of folklore studies in a society characterized by globalization. The first is that the main aspect of folklore studies should be to capture the different aspects of the changes that influence our daily life. This would mean broadening the field of folklore studies, which has been restricted until now, to a wider range of research. The second expectation involves the participation of people from different backgrounds. This kind of research environment will undoubtedly give birth to new concepts and ideas. It would be profitable for the Society of Living Folklore to develop into such an environment. My final request would be to encourage an interdisciplinary dialogue, through which the limitations and possibilities of folklore studies will become clearer. It has been some time since people began to argue that folklore studies is in decline. The author might not be alone in thinking that a huge gap is opening between folklore studies and history as an adjacent academic field. In this paper, by looking back at works of and exchange among Tatsuo Hagiwara (Medieval history), Yoshihiko Amino (Medieval history), and Yoshio Yasumaru (Modern history), all historians who were active in the 1970s and 1980s and who positively evaluated folklore studies in Japan, the author provides, in the form of a memoir, insights into the possibility of integrating folklore studies and history, before questioning the integration of folklore studies with sociology, cultural anthropology, and ecology as currently proposed by scholars of folklore studies. From a historical point of view, one characteristic of Japanese villages is that they had high literacy rates and that the people living there utilized various documents or records for their lives. That’s why a school known as historical folklore studies has developed among Japanese folklorists. In recent studies of Japanese history, a new trend can be seen in the treatment of written materials. The new method is not to describe past events using information from the documents, but rather to reconstruct the social environment in which it actually functioned. Historians changed the perspective of their field from being a container of old information to being a vivid media in actual society. As a new issue concerning written materials, this paper focuses on some documents in the long process of transmission from generation to generation and aims to grasp them as living media creating an original perceptual communication around itself, not as indirect clues like time capsules conveying facts from the past. We are paying particular attention to the visual style in expressing folk words. This standpoint will enable us to define the unique function of written materials in an audiovisual space. Furthermore, we can expect to put this visual style correctly in complex relationships with the oral, plastic, architectural, behavioral, and other media, into which Japanese folklore have mainly concerned itself up to now. Japanese emigration overseas is an important part of the modern history of Japan. As it intersected and mixed with various cultures, the Japanese/Nikkei culture of Brazil recreated itself repeatedly, and became recognized also as an element which constitutes Brazilian culture. In this paper, we review Japanese immigration and Nikkei society in both Japanese folklore studies and Brazilian folklore studies. We also survey the latest tendencies and latest results of folklore studies dealing with the movement and recreation of “matsuri/events,” which is one of the areas of interest of the author. After this review, we will consider the potential of folklore studies for investigation and research on Brazilian Nikkei society, introducing the Japanese ethnic event of the Oriental Town in São Paulo, and the old and new Bon festival dances of Londrina in Paraná as examples. What Should We Learn from the “Present” of Folk Performing Arts? In this article, the author aims to describe recent tendencies in the research of folk performing arts, and, in response to that, to indicate a few points where fruitful research can be expected. Today, many researches deal with themes involving particular situations surrounding folk performing arts, such as tourism and cultural policy conducted by the national government. Tourism and cultural policy are both seen as causes of so-called “folklorism” or “resourcization of culture,” meaning the re-contextualization and utilization of folk performing arts outside of their “original” context. However, the author has some apprehension concerning this situation. Many examples of present practices in folk performing arts are explained as cases of folklorism. As a result, attention tends to be given only to clearly new means of performance. As a result, seemingly “traditional” means of performance, such as those in local festivals, are not seen as appropriate focuses of study of the “present” of folk performing arts. Needless to say, these apparently “traditional” means of performance are not forever unchanging, but are the consequences of extremely dynamic processes of transmission. In the transmission processes, the “present” has an enormous influence. To understand this dynamism in the process of transmission, we would like to suggest focusing on two points: (1) the body, and particularly changes in ways of training with the body, and (2) changes in the social relationships of people involved in the overall practice. Considering these points in the “present” situation will make it possible for us to get closer to a comprehension of the mechanism of transmission of folk performing arts, which is an old but simultaneously new theme of in study of folklore. Many systematic humanities and social sciences studies that include folklore become “study for study’s sake,” as they pursue objective subtlety. Both the establishment and disestablishment of systems of study entails the serious problem that study becomes estranged from reality and the dweller itself. However, “Folklore as a method,” which involves sincere opposite to the field, can be a power opposing the original systematization. Moreover, it can lead to autonomous practice by the dweller, and to the possibility of improving the nature of the field practice of other studies. We should cultivate each “Study as a method” in the field by holding vigorous discussions not inside but with other studies.